The GVK group has acquired the entire 10% stake of Airports Co. South Africa Global Ltd in Mumbai International Airport Ltd for ₹924 crore, increasing its total holding in the airport to 74%. MIAL runs the Chhatrapati Shivaji International Airport in Mumbai, one of the busiest in India, as a special purpose joint venture company in which GVK initially owned a 50.5% stake, while two South African companies, Bidvest Group and ACSA Gobal Ltd, held 13.5% and 10%, respectively. The remaining 26% is held by state-run Airports Authority of India. On February 25, GVK Airport Holdings Ltd, a subsidiary of GVK Power & Infrastructure Ltd, signed a definitive agreement with Bidvest Group, exercising its “right of first refusal” to acquire its 13.5%. The GVK group did not specify the reason for doing so. 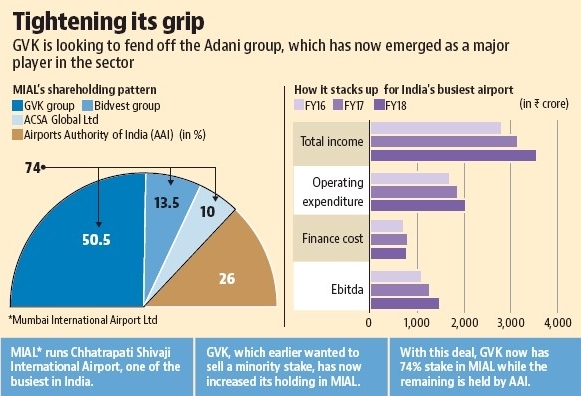 However, the move followed reports that the Adani group was interested in picking up Bidvest and ACSA’s stakes in MIAL. The Adani Group is among the latest entrants into India’s airport sector. In February, Adani Enterprises Ltd won the rights to run five of the six domestic airports that are being privatized, beating rival bidders by a steep margin and overnight turning into India’s largest private airport operator. GVK has, with the acquisition of the ACSA stake announced on Friday, bought out the remaining consortium member.